Strong regional collaboration is needed for southern African countries to improve their access to international climate change funds. Therefore, the importance of organised learning forums cannot be underestimated. From 25 - 26 October 2018, six countries from southern Africa came together in Swakopmund, Namibia - to share their experience and learnings on accessing climate finance, specifically from the Green Climate Fund (GCF). The GCF is a global fund created to support the efforts of developing countries in responding to the impacts of climate change. However, the process of accessing funding from the GCF can be a long and challenging one. With this in mind, SouthSouthNorth - under the Southern Africa Climate Finance Partnership (SACFP) project - organised a Regional Learning Forum, to provide a platform for National Designated Authorities (NDAs), nominated entities and Accredited Entities to the GCF to network and explore shared challenges and opportunities. Co-hosted by Namibia’s Ministry of Environment and Tourism, in partnership with Namibia’s Environmental Investment Fund, the event brought together over 40 delegates in the coastal town of Swakopmund. Mr Teofilus Ngitila, Acting Permanent Secretary of the Ministry of Environment and Tourism, officially opened the Learning Forum. In his opening address, Mr Ngitila stressed the need for southern African countries to prepare for, and adapt to, the impacts of climate change - and do so quickly. “The presence of so many NDAs and Direct Access Entities is an indication that we are determined to tap the much needed resources from the Green Climate Fund in order to rapidly increase adaptation and mitigation actions in our respective countries”, he said. It is hoped that this Learning Forum will be a springboard for southern African countries to start communicating more regularly around their climate change activities, especially their progress and challenges with accessing climate finance. A second Regional Learning Forum is expected to take place during the first half of 2019. 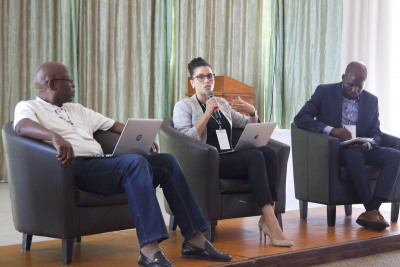 During the Leaning Forum, leveraging climate finance was seen as key to supporting countries in protecting Africa’s development gains from the impacts of climate change. In his closing remarks, Mr Petrus Muteyauli from Namibia’s Ministry of Environment and Tourism noted that southern Africa is well known to provide leadership in many areas, so by continuing to work together, the region can become a frontrunner in addressing climate change too.